In my post yesterday, I raised the question of the optimum ratio of stride length to cadence. Speed is the product of stride length and cadence, but if we wish to increase speed efficiently, it is not simply a matter of increasing one or the other. There is little doubt that efficient running requires a fairly rapid cadence. Video recordings of elite athletes demonstrate that most run with a cadence of at least 180 steps /min (90 per foot), and many recordings of elite 10K runners demonstrate a cadence of 200 steps per minute or slightly more. However, there are several reasons why there is likely to be a point beyond which increase in cadence become inefficient. First, there are factors related to the internal (molecular) mechanism of muscle contraction. A muscle contraction involves formation and breakage of chemical cross- links as the chain-like actin and myosin molecules slide past each other. The evidence suggests that maximum efficiency is achieved when the rate of contraction is about one third of the maximum velocity of shortening of the muscle (Koushmerick and Davies, 1969). Secondly, there are external mechanical factors that would make very high cadence inefficent. Very rapid starting and stopping of the actions of repositioning the limbs is inefficient (Cavagna and Franzetti, 1986). Therefore, as speed increases there will come a point beyond which it is no longer efficient to increase cadence. Observational evidence suggests that this optimum cadence is around 180-200 steps per minute (90-100 per minute for each foot). Beyond this stage increase in stride length is essential for any further increase in speed. It is almost certain that my current step rate of around 245 steps per minute when sprinting is inefficient. I need to increase my stride length. However, the issue of the most efficient way to increase stride length is a challenging question. Reaching out with the swinging leg so that the foot lands too far in front of the centre of gravity (COG) will result in a wasteful and jarring braking action that decreases efficiency and is likely to increase the risk of injury to knees, hips and spine. This might suggest that we should aim to have the point of support behind the COG throughout stance. However, this would also present problems. While point of support is behind the COG there will be a gravitational torque producing a head-forwards and downwards rotation. If this is not reversed at some point in the gait cycle, we will end up flat on our face. It is therefore tempting to think that we should spend as little time on stance as possible. However once we are airborne, we are subject to the downwards pull of gravity. The impulse that gets us airborne will cause us to follow an arch-like trajectory. Gravity will nullify our ascent by mid-flight and for half of each airborne period we will accelerate earthwards at 9.8 metres/sec/sec. If cadence has an upper limit, the duration of each step must have a lower limit. If we spend half of this time in free fall, we must necessarily lose height and regain it in the next airborne phase. So being airborne extracts a large energy cost. In addition, because the average upwards force acting throughout the gait cycle must be equal to body weight, a very short time on stance demands a very large upwards force during time on stance to provide the impulse necessary to get us airborne. Therefore despite the immediate attraction of the proposals that we should land with the foot under the centre of gravity and that we should spend as little time on stance as possible, these proposals present serious problems. The challenge of working out how to run most efficiently has no easy answer. There are many things about running mechanics which cannot be described precisely in terms of either physics or physiology, but there are a few important things that can be established with confidence from the laws of physics. Before attempting to reach a decision about the best way of increasing my stride length, it is worthwhile to step back and examine a few of the conclusions that can be drawn with confidence. Unfortunately, this discussion does require that we grapple with some of the principles of Newtonian Mechanics. As I remarked in the previous paragraph, there is no easy answer, but I think the intellectual effort is worthwhile if it leads to a constructive plan for the application of physical effort in training. First, it should be stated that despite the impression created by some recent theories, such as Pose and Chi, that emphasize the benefits of gravitational torque, gravity can provide no net energy when running on a level surface. The law of conservation of energy dictates that gravity can only provide energy if the centre of mass suffers a net fall. When running on a level surface, a fall in one part of the gait cycle must be compensated for by a rise at another phase of the cycle. If gravitational torque plays any useful role at all, it might be that the unbalancing associated with gravitational torque triggers a reflex muscle action that gets the foot off stance and initiates the swing phase. Although gravity does not provide net energy, it plays a major role in running because the essence of running is getting airborne. At low speeds, walking is a very efficient form of locomotion. A walker maintains unbroken contact with the ground and relatively little energy is spent lifting the body. Most of the energy costs of walking are consumed by repositioning the limbs at each step, and in compensating for the braking effect that arises when the leading leg presses obliquely against the ground at footfall. As speed increases, the leg and foot must undergo increasingly rapid acceleration to catch up with the torso, and then suffer a corresponding deceleration in late swing phase. As a result, the energy costs of repositioning the limbs increase rapidly with increasing speed, and there comes a point where walking fast becomes inefficient. At this point, it is better to pay the price of getting airborne. Perhaps surprisingly, the costs (per Km) of getting airborne actually decrease with increasing speed when running. This is because when moving at a higher speed, momentum carries us further during the arch-like trajectory of a given height. If we maintain a trajectory of the same height on each step, we need fewer steps per Km and hence the energy cost of getting airborne (per Km) actually decreases as speed increases. However, in considering the overall energy requirements of running we must also take account of the costs of braking and the costs of re-positioning the limbs. The observational evidence that runners land at least a short distance in front of their centre of mass suggests that most of the compensation for the head-forwards angular momentum generated by gravitational torque in the second half of stance is provided by an opposite torque acting the first half of stance. An alternative possibility, suggested by Simbil in his comment on my blog posting on 24th February is that a backwards push in late stance reverses the head-forwards angular momentum generated in the second part of stance. I believe Simbil’s proposal would lead to a violation of the law of conservation of linear momentum, but for the time being, this debate between Simbil and myself has not been completely resolved. Nonetheless, there is little doubt from observational evidence, that all runners do land with the initial point of support in front of the COG, thereby providing for at least part of the reversal of the head-forwards rotation. Landing in front of the COG inevitably results in a braking force because the leg is angled forwards and down at the point of impact, and therefore pushes obliquely against the ground. The ground reaction force pushes back and up. The backwards component of this push acts as a brake. While the energy cost of braking can be reduced by spending only a short time of stance, and thereby producing less braking and angular momentum due to gravitational torque, the price is the need for a greater vertical push on the ground. Because the upwards impulse exerted by vertical ground reaction force, averaged over the entire gait cycle must be equal to body weight, a shorter proportion of the time on stance demands a greater the vertical ground reaction force during the time on stance. If one third of the gait cycle is spent on stance, the average vertical ground reaction force during stance must be three times body weight; the peak might be substantially higher. An additional crucial issue is the fact that the muscles and tendons can absorb some of the energy of impact at footfall, and this elastic energy can be recovered at lift off, thereby providing part of the energy necessary to get airborne. Typically, about 35% of the stored energy can be recovered. However the capture and release of elastic energy takes time as the tissues must stretch and then contract again. It is difficult to calculate the minimum time required for this stretching and contraction because muscle and tendons are actually viscoelastic- that is, their elastic properties change as the load changes. They are quite stiff when loading is rapid but less stiff when loading is slower. Observational evidence suggests that it is necessary to spend at least 70-80 milliseconds on stance if elastic energy is to be recovered and re-used efficiently. The energy cost of repositioning the limbs will increase as running speed increases, although a full explanation requires some mathematics. Peluko presented the mathematics in a comment on my blog a few weeks ago. The essence of the argument is that at higher running speeds (and approximately fixed airborne time) the foot must accelerate faster to catch up with the torso because airborne body follows a longer trajectory. Rapid acceleration requires a large force. As this larger force acts for a similar length of time, the transfer of momentum to the leg and foot will be greater and will consume a larger amount of energy. I believe that in his calculations Peluko over-estimated the magnitude of the increase because he did not allow for the fact that the action of pulling the foot towards the torso actually slows the torso a little. Thus some of the energy required for accelerating the foot can be extracted from the kinetic energy of the moving torso. This kinetic energy is then returned to the torso in late swing when contraction of the hip extensors pulls the swinging leg back towards the torso. Nonetheless, although the cost of repositioning the legs is not as large as Peluko estimated, I agree that there will be a substantial relative increase in energy cost per Km with increasing speed. Direct observation indicates that the total energy cost of running per Km (which can be computed fairly accurately by measuring fuel consumption) remains almost constant as speed increases. This suggests that the saving on energy (per Km) required for getting airborne as speed increases is consumed in the increased energy cost of repositioning the limbs. There are at least three major factors that create a demand for muscle strength and power if we wish to run fast. 1) the ability of the extensor and flexors of the hip, knee and ankle to absorb a substantial portion of impact energy as elastic energy and to release this by a controlled approximately isometric contraction in late stance to help propel the body upwards. 2) A powerful concentric contraction of the hamstrings (hip extensor and knee flexor) to initiate the upward swing of the foot towards the buttocks followed by powerful concentric contraction of the hip flexors to accelerate the trailing leg and foot forwards to overtake the torso in mid-swing. 3) A powerful eccentric contraction of the hip extensors to arrest the forward swing of the leg so that at footfall the foot is only a short distance in front of the COG. Of course we require not only strength and power, but also exquisite neuromuscular coordination to achieve these actions in a timely manner. I believe that when we are running, we should not focus our attention on these individual actions, but instead devote our conscious attention to maintaining a sufficiently rapid cadence while relaxing all non-essential muscles. Provided we have developed the required strength, power and coordination, stride length will be adjusted automatically. It is clear that despite being able to run fairly efficiently at slow speeds at present, I do not have the strength, power and coordination required to maintain an adequate stride length at high speed. I had originally intended to outline my plans for developing the required strength, power and neuromuscular coordination in this posting, but the story is already more than long enough to be digested at a single sitting, so I will defer the remainder of the story until early next week. In the past few weeks I have been focusing on an attempt to reverse the loss of strength and speed that occurred over the past 40 years. It appears that I am making appreciable gains in strength and power, as assessed by tests of hopping distance, but so far there has been no clear cut gain in running speed. In part the lack of evidence for improvement in speed might reflect the fact that I do not have access to a track and I have been testing my speed over soggy (or snow covered) grass. Variations in the surface are likely to obscure any improvement in my speed. However testing of my time over 100m is not my biggest concern at present. My focus is not primarily on decreasing my 100m time but rather on my capacity to generate an optimum stride length. Ever since I obtained a foot pod that gives (reasonable reliable) estimates of my stride length I have been intrigued to note that as I increase pace during either a tempo run or an interval session, my cadence rises but my stride length increases relatively little. At first sight, this might appear to be the inevitable consequence of the running style described on the page Running : a dance with the devil (in the side panel). For the reasons described in that article, I believe that relatively high cadence is indeed the safest and most efficient way to run. Focus on increasing stride length creates a risk of over-striding with the resulting wasteful and injurious braking forces that arise when the foot lands too far in front of the body’s centre of gravity. However that belief requires some qualification – almost certainly there is an optimum balance between stride length and cadence. I believe that when trying to run fast, the mental focus should be on getting the stance foot off the ground quickly, rather than on pushing against the ground, despite the fact that a short time on stance necessarily demands a large ground reaction force. The conscious initiation of a specific muscular action is slow, so I believe it is more effective to foster a mental image of the goal – a short sharp lift-off, rather than the a mental image of a downwards push. Furthermore, the required push is almost certainly not achieved by a deliberate concentric contraction of the quads and calf muscles but more likely by an almost isometric contraction that controls release of elastic energy stored at foot-fall. While I am still inclined to believe that the principle of focusing on rapid lift-off from stance is correct, implicit in this belief is that the muscles are nonetheless strong enough and sufficiently well coordinated, to achieve the required push against the ground. Neither conscious intention to push, nor regulation of the required muscular action by an automatic motor program initiated by the intention to get the foot off stance quickly, is likely to succeed if the muscles are not strong enough. In my sprinting sessions in the past few weeks, I have directed my mental attention towards getting my foot off stance quickly. The result has been that my step rate increases to around 240 steps per minute (123 with each foot) but my step length increases only to around 1.5 metres. (I am 1.7 m tall). Although I did not measure my sprinting step length in my youth, I am fairly sure it was well over 2 metres. I think it is likely that I now have a sub-optimal step length and that this is almost certainly due to loss of muscular strength and neuromuscular coordination. It is well documented that both muscles and nerves degenerate with age. However it is also well documented that muscle power can be improved by resistance exercises even in old age, and it is probable that the relevant neuromuscular coordination can also be improved. While it is unlikely that lost nerve cells are replaced to any large extent (though recent studies show even this might in principle possible) there is little doubt that the connections between nerve cells can be made more efficient. Hence, in the past few weeks I have been again thinking about running mechanics in some detail, with the goal of designing a program of strength and neuromuscular training that is likely to lead to recovery of a more efficient ratio of stride length to cadence. So far I do not see any reason to make major changes in my beliefs about running style. In fact recordings of my heart rate when running in the low to mid aerobic zones suggest that I am currently running reasonably efficiently at slow paces. Rather, I need to work on developing the strength and coordination that will allow me to maintain an optimum ratio of stride length to cadence when I attempt to increase the pace. I have not yet reached any definitive conclusions though I think I am making some progress. Now it is time to go for a run before darkness descends. Tomorrow I will present a summary of my thoughts so far, and my plans for putting those thoughts into action. About 7 weeks ago I formulated a long term plan to prepare for a ‘good’ marathon in three years time – after I have retired from work and when I hope I will have enough time to achieve the training volume necessary for a marathon. By training smart, I meant planning a program with identified goals, and being prepared to adjust the program if the goals were not being achieved. I set as the specific goal for the first 12 weeks of my three year program, the recovery of the leg strength that I have lost over the past 40 years – a loss of strength that has left me with a stride length that rarely exceeds 1metre. I also have a background goal of gradual improvement of my aerobic capacity. That background goal will continue to be on the agenda throughout the three year program. 8. yoga exercise focused on flexibility, balance and body awareness. I anticipated training for about 4-5 hours per week, and set the target of achieving at least 80% if the specified sessions, to allow for the occasional substation of an alternative activity such a hill walking, swimming, cycling or kayaking. 2) Sprint speed: the distance covered in 15 seconds. As I train mainly on woodland or riverside paths, or on soggy grass, I employ my Polar heart rate monitor and S3 foot-pod set to record pace averaged over 3 consecutive 5 second intervals, to avoid the need to measure distance on the ground. However the uncertainty of the measured pace is probably around 3%. 3) Aerobic capacity on the elliptical cross-trainer: average heart rate during a stair case of 7x2minute steps spanning a power output of 30 to 230 watts – anticipated to cover the aerobic zone. 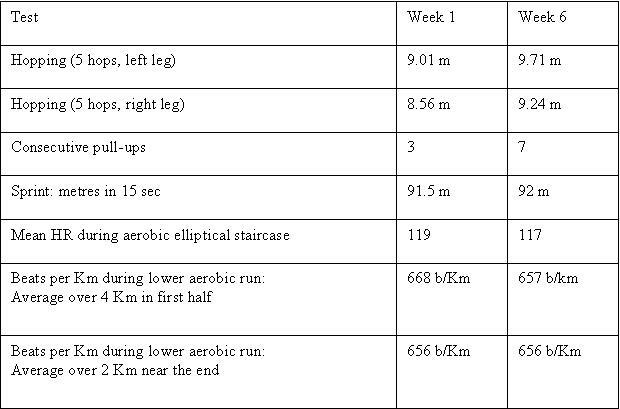 4) Aerobic capacity when running in lower aerobic zone: beats per Km for two segments of 2 km each within the first half of the 15 Km run, selected to cover flat terrain and in opposite directions to minimize the effect of wind. I also decided to evaluate upper body strength by assessing the maximum number of consecutive pull-ups – this is probably not relevant to marathon preparation, but is relevant to my overall long term goal of limiting the rate of loss of strength as I grow older. The most important observation is that the hopping test demonstrates that my leg strength has improved. It should be noted that the weaker performance when hopping on my right leg was anticipated. I have suffered from episodes of inflammatory arthritis since my mid-teens. The right knee has been the most frequent site of the attacks of acute arthritis and after 50 years of these episodes, I now have some evidence of permanent damage. So despite the fact that as a youngster I kicked a football with my right foot and I have always used my right leg for the initial push on the pedals when cycling, I am not surprised that my right leg is weaker than the left. I am pleased that there have been similar increases in strength in both left and right legs, though I am aware of the need to be cautious in the demands I make upon my right leg. However, several studies have shown that exercise is beneficial for joints damaged by arthritis, so I am confident that provided I proceed cautiously, it is reasonable to aim to equalize the strength of my legs. The dramatic improvement from 3 to 7 consecutive pull-ups probably reflects the fact that I have done very little to maintain upper body strength in recent years, and even a small amount of resistance work – in fact about 15 minutes per week over the six weeks – has produced a rapid though only partial recovery of my former strength. When I was younger, I could do 10 consecutive pull-ups and I will be very pleased if I can recover that level again. I am a little disappointed that there been no discernible increase in my speed – perhaps I need to develop a more reliable test, though the consistency of speed estimates throughout the six weeks suggest that the test at 6 weeks is a realistic reflection of the absence of any appreciable increase in speed. Maybe I need to be patient, and wait until the gains in leg strength are more substantial. Perhaps I also need to do some drills to improve neuromuscular coordination. The slight decrease in beats /Km in the first half of the 15 Km run suggests a trivial improvment in my aerobic capacity, but this improvment is not significant. The lack of substantial change is almost certainly due to the fact that the total volume of aerobic training has been small. If I convert elliptical energy consumption to equivalent distance run using the formula 100 Kcal = 1.6 Km , my average weekly volume of aerobic training in the past 6 weeks has been 34 Km/week. In the 12 weeks prior to starting this program, my weekly average was 41 km/week ( a period during which I was recovering from illness in mid-summer). The average over the preceding 10 months since January 2009 was 45 Km per week. The inclusion of resistance training has necessarily resulted in a reduction in aerobic training volume, so perhaps it is not surprising that my aerobic capacity has not improved. The only reason for anticipating any improvement despite the reduction in volume was the fact that during the preceding few months I had been recovering from an episode of illness. However, despite the lack of improvement in the past six weeks, it is pleasing to see that even at the beginning of the current six week program, there was no upwards drift of heart rate during a 15Km run in the lower aerobic zone. Hadd suggests that it is time to increase the pace of aerobic training when heart rate remains stable during a 10 mile run (16Km), so perhaps it is time to increase the pace of my lower aerobic runs. In the remaining 6 weeks of this 12 week cycle, the main goal will be to continue to increase my leg strength. The current program of body-weight resistance training appears to be beneficial, so I will increase the amount of this work from 30 min per week to 45 min per week. I will also introduce some low intensity plyometrics (hopping; lunge jumps etc). Eventually I will increase the resistance in the resistance sessions, by using dumbbells or barbells, but I am in no hurry to do this in light of the need to be cautious in loading my right knee. I will experiment with some drills to improve neuromuscular coordination with the goal of improving my sprint speed, but increased sprinting speed is not high on my list of priorities and therefore I cannot afford to devote a great deal of time to these drills in the near future. Because my total training time is limited there is no scope for increasing aerobic training volume at present. I will increase the speed of the 15 Km runs a little, but I am also aware of the need to avoid making all my sessions intense. At present I am enjoying the easy 15Km run each week, and I do not want to make this session onerous. I am confident that if I am patient, my aerobic capacity will eventually begin to increase. I am aiming for 600 beats/Km when running in the low aerobic zone, by the end of next summer. You are currently browsing the Canute's Efficient Running Site blog archives for December, 2009.